This play is from the Arizona Basketball Coaching Newsletter. 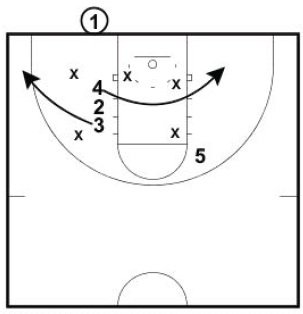 It is an inbounds play to run against a 2-3 zone. If you would like to be added to their monthly basketball coaching newsletter. I need your name, coaching position, and school and I will forward it on to their Director of Basketball Operations. 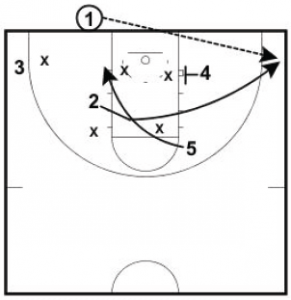 I have also listed some links to other under out and side out inbounds plays. When the official gives the basketball #1 , #3 goes beyond the arc in the ballside corner. #5 cuts to the block in front of the ball. Please ad me to the Arizona ball newsletter.